BetOnline was founded as a land based sportsbook and casino property in 1991. In 1999, they jumped into the growing online gaming market, changed their name from BestLineSports to BetOnline, and quickly became a leader in the online casino and sportsbook industry. Originally, BetOnline was not interested in casino gaming. Founded as an online bookmaker only, BetOnline made a name for themselves by offering a discounted line price, -108 rather than the standard -110. It wasn’t until 2006 that BetOnline got into the casino gambling business. BetOnline now also operates a full-featured online poker room on the Chico Poker Network, making BetOnline a single destination for online casino gamblers, sports bettors, and poker junkies alike. 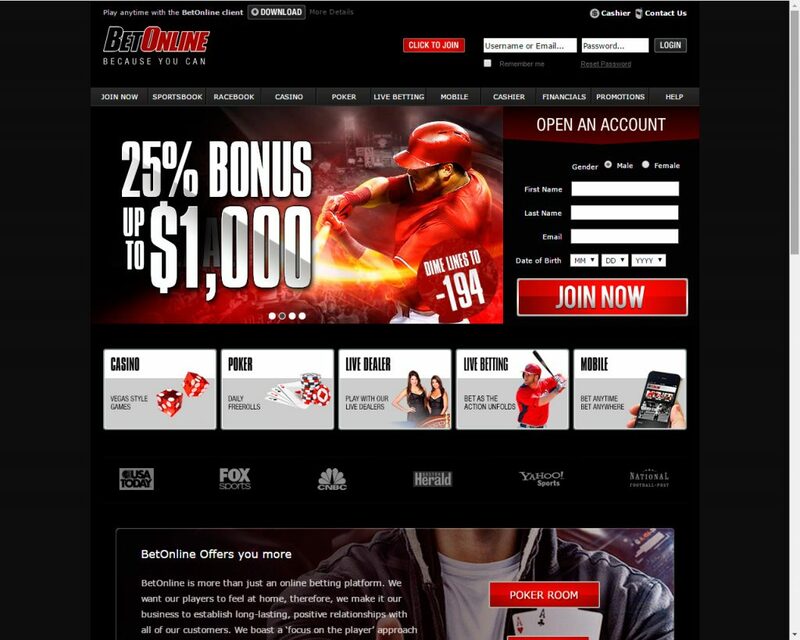 The main bonus program at BetOnline is called the Lifetime Bonus Guarantee. Rather than offer a one-time welcome bonus, BetOnline guarantees that you can earn bonus cash on each and every deposit you make to your player account. 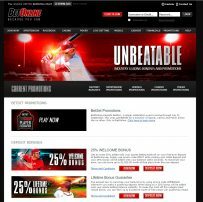 BetOnline will match every deposit you make of at least $50 at a rate of 25%, regardless of what method you use to deposit the money. This bonus maxes out at $900 per deposit, meaning that all deposits between $50 and $3,600 will earn you a 25% match bonus, every time you add money to your account. 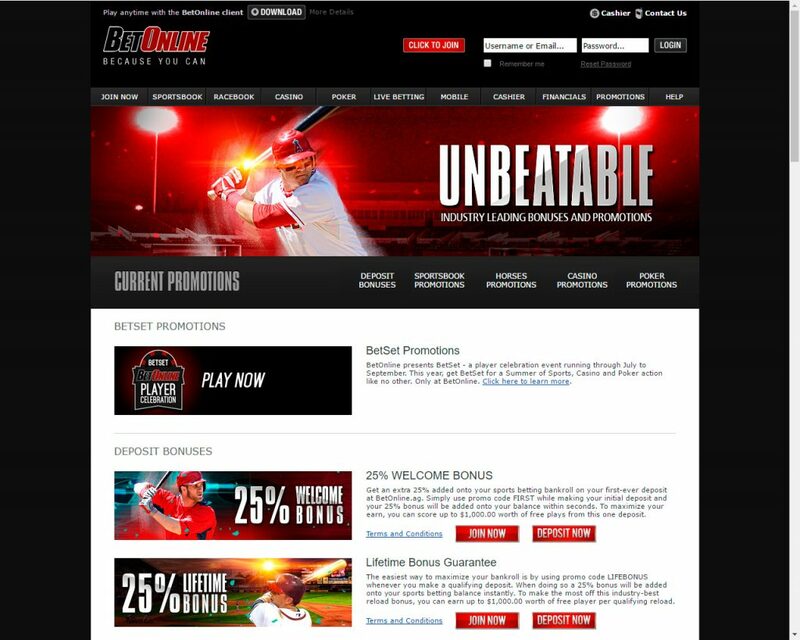 BetOnline also offers special promotions for their sportsbook customers. These bonuses change with the season, since different sports and sporting events happen at different times of the year. As of this writing, for instance, BetOnline is offering bonuses on NCAA March Madness bets, NHL hockey bets, and wagers on international soccer matches. Check the BetOnline sportsbook bonus page for the latest bonus and promotional offers for sports bettors. Casino gamblers and poker players also have their own bonus and promotional schedule. These bonuses and promotional offers also change seasonally. For an example, right now BetOnline offers their casino gambling customers a 25% reload bonus for specific casino game titles, good on all deposits made to their player account for a limited time. Most of BetOnline’s poker promotions seem to take the form of special tournament entry fees and prizes, like the promotion currently running offering poker players a 25% deposit match paid off in Promo Bucks, which are a special kind of currency used at BetOnline to pay tournament entry fees. The BetSoft software used by BetOnline Casino to provide online casino gaming is not as well known as RTG or Playtech, but offers more than 100 different casino gaming titles including a popular line of 3D slots. 3D graphics are nothing new to online gaming, but customers seem to like 3D graphics, especially slot machine and video poker players. BetSoft’s casino software isn’t limited to slot gaming, though that’s what they’re most famous for. You can find a full lineup of casino games at BetOnline, broken up into the following categories: table games, slots, 3D slots, and video poker. You can also customize your own “favorite game” list so that when you log in to the site you’re brought immediately to your favorite game titles. For a site that began as a sportsbook only, BetOnline has an excellent variety of casino style gambling. BetOnline makes full use of BetSoft’s game lineup, hosting all seventeen of BetSoft’s video poker titles, all 19 of BetSoft’s non-3D slot titles, almost all of BetSoft’s 3D slot games, and all 22 of the casino table games BetSoft has in their library. If you’re used to traditional casino table gaming, BetSoft’s table games may surprise you a little. Ten different versions of blackjack alone are available to play at BetOnline, each with different rules. Blackjack fans love the single deck game hosted at BetOnline, and there are other special versions of the game (such as Switch and multihand blackjack) to give fans of casino blackjack more rule variation choices than most other online casinos. Gamblers can also choose between European and American style roulette as well as 8 different casino table versions of poker, such as Pai Gow, Let it Ride, and Oasis Poker. For slot gamblers, BetOnline gives you the choice of classic 5-reel and 3-reel slots as well as 18 different 3D slot games. 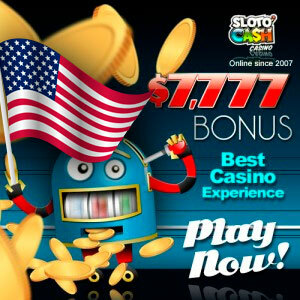 Whether you enjoy classic slot gaming or are interested in a more modern take on the one-armed bandit, BetSoft’s casino gaming suite offers the kind of variety that slot machine players look for. 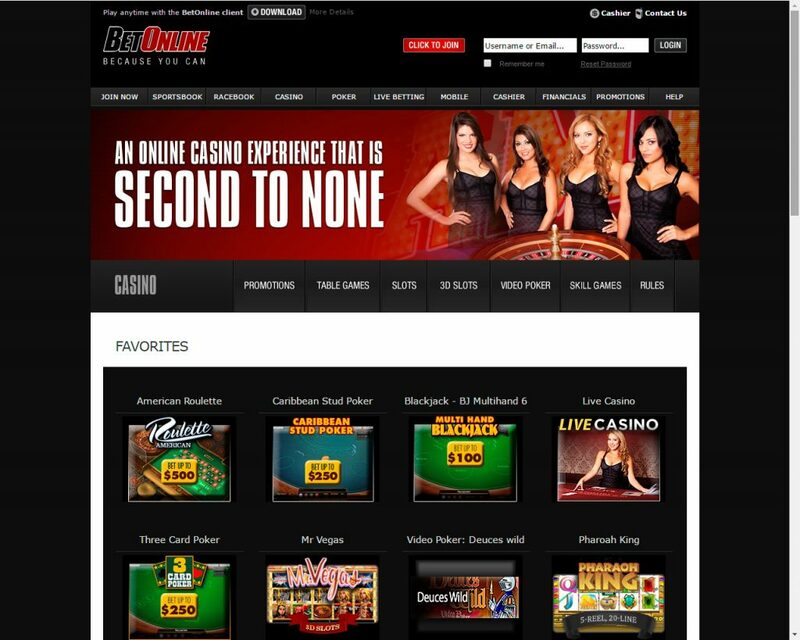 Before you join BetOnline Casino, make sure you have access to one of their deposit and withdrawal options. Members from some countries may not have access to specific deposit and withdrawal methods, so check to make sure you have a way of funding and withdrawing from your account before you open one. The quickest way to withdraw money from BetOnline Casino is to have your withdrawal sent back to your original deposit method, especially if you deposited with a VISA or MasterCard. For customers from some countries, withdrawals to your VISA or MasterCard may not be possible in which case using an eWallet is the fastest way to get to your money. The slowest way to make a withdrawal is to have the site send you a paper check. This can take as many as 30 business days, so avoid this if you possibly can unless you don’t mind waiting a couple of months for your money. BetOnline offers their customers four different ways of getting in touch with customer service for any questions or concerns related to the site. You can use live chat to talk directly to a customer service rep during live chat hours, connect with them via Skype, or call a toll-free phone number. BetOnline also has an email address set aside for customer service issues. BetOnline’s game library may not be as big as some competitors, but offering multiple versions of casino classics like blackjack and roulette is impressive. Allowing customers to connect with customer service via live chat is a nice feature, one that’s disappearing at other online gaming sites. A healthy lineup of bonuses and promotions should keep customers busy chasing bonus cash. BetOnline isn’t the prettiest or most popular online gaming site, but the combination of a casino, a poker room, and an online sportsbook makes it a convenient way to get your online gambling fix. 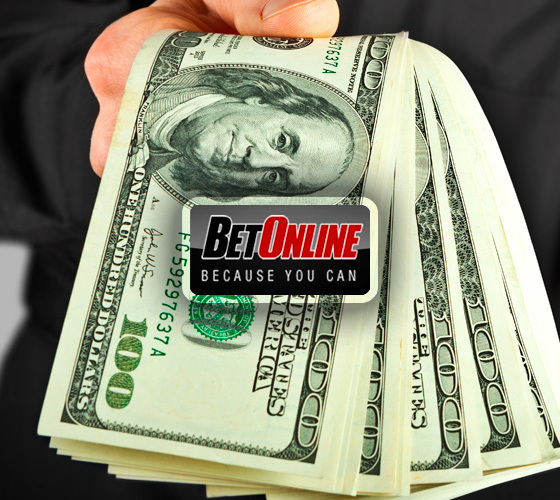 Bet Online recently moved their gaming license from Costa Rica to Panama. They are now fully licensed and regulated from Panama City, Panama.